Since the first time I stepped into my first rented flat in Enfield, I knew, that turning the kitchen into your own personal space is not always a valid option. Fortunately, there are several easy ways to add your own pattern in your kitchen, without getting on your landlord’s nerves too much. The kitchen of the grown-up. The beauty of interior design and the inspiration is to find a way to be creative in your own habitat. So remember, even if you live in a rented flat or a house, there are ways to make the kitchen more practical and cosy. Speak with your landlord to find out what’s allowed to change and what’s not, and begin to work the next weekend. Here are some things you can try doing over the rest days. Honestly, sometimes the quality cleaning of your kitchen, oven and the rest of the appliances can do wonders. Spend some time over the weekend to clean the kitchen very carefully. Cleanse every nook and cranny and hard to reach place and begin the week with a refreshed kitchen and meals for the heavy working week. Pay special attention to the dirtiest places in your kitchen — the floor around the cooking space, the sink, the oven and the garbage bin. Lots of food waste falls on the floor while cooking and soon it loses its shine. Make sure to swipe the dust and go over with a cleaning floor solution and a mop. Same is the deal with the sink — lots of cooking, lots of food debris there and around the syphon. Disinfect it with a strong bacteria killer solution — be it your favourite home-made recipe or a trusted commercial cleaning brand. There aren’t many people that enjoy a dirty, oil-smeared cooker, with burnt-on stains all over the appliance that makes it one smelly and bacteria-roaming place. I always try to keep my oven in a tip-top condition — and it’s not always that easy. You might not be able to do a thorough deep oven cleaning over the weekend — at least, according to the professional oven cleaners around home in Enfield, it takes more than a couple of hours to get it done, and here we are trying to do as much as possible around your kitchen to make it pretty. So, once in a while I deep clean the oven, but every week I run over the hobs with a degreaser and wash them to a shine. I keep at least the outside of the oven, as well as the cooker door as clean as possible and presentable. Your landlord will define the extend of your freedom as an interior designer. This design includes movable shelves and a black board on the wall, in most of the cases. If you want something simpler, a little table will do the job, together with an appropriate decoration and shelves for your coffee accessories. The book shelves, hanging in the kitchen, are perfect for this. Put your beautiful items out in the open! You can place the culinary books, the dishwashers, pictures and photos and all kinds of gadgets. There are different sizes of shelves, so pick the one that fits the best in your kitchen. Placing the shelves on your wall or in the corner is a great way to get your kitchen in order. 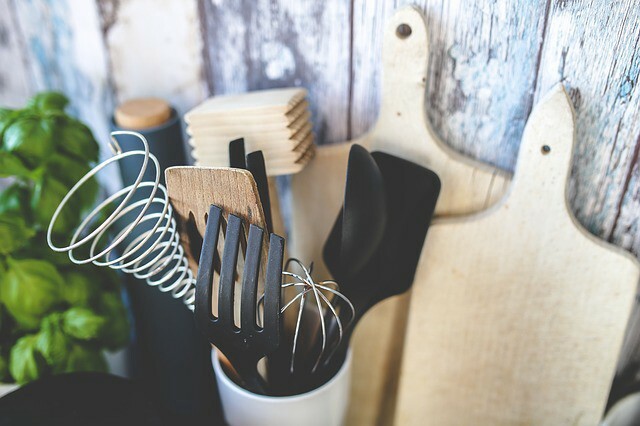 Put there the most used utensils, so that you can find them easier, when you unleash yourself in the kitchen. 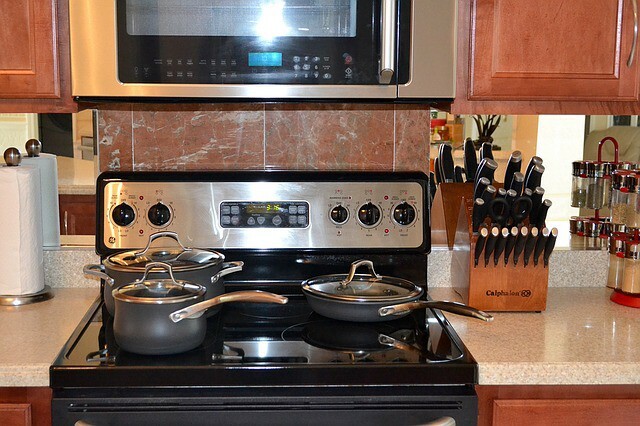 What you use the most in the kitchen should be in a comfortable and easy to reach place. So, take out the most used towels, gloves, sponges. There are many bacteria growing inside the sponges so it’s best to throw it out after several weeks of usage. Take out the tablecloths and the new wooden spoons you want to use. You can cover the kitchen floor with a carpet, so that it gets even cosier. If you have enough free spaces on the kitchen floor, put a movable kitchen table in the middle of the room. You can use it to store the utensils or as a worktop. It will also add to the overall image of your kitchen. If you landlord doesn’t mind, paint the walls of your kitchen. If you have this opportunity, dare to turn the boring kitchen in a bright and funny room. If you fancy having lots of pots with plans, sow the most used spices and herbs in your recipes. This way you will have an abundance of herbs, home grown by you. Decorating your kitchen is one of the easiest ways to turn it into something that belongs to you. 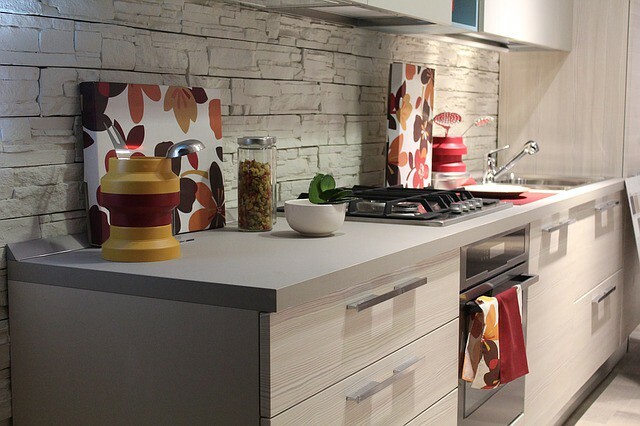 Go around the home utility shops, in order to find the appropriate accessories for your kitchen or at least to get an inspiration and think of your own way for decoration. Look for things that grab your attention and will contribute to the current kitchen decorations.